The SB-6920 is CAT5 a distribution amplifier RECEIVER. 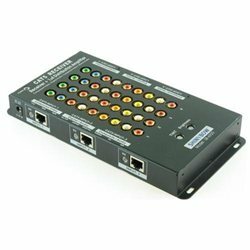 Support receive from Category 5 UTP cable with high speed 160 Mhz Video Bandwidth. Totally three groups of signals distribution amplifier as Component Video, Digital Audio, Composite Video for output to multiple High Definition HDTV/palsma display. User adjustable gain the Tint and brightness with high frequency broadband gain adjustment.